Daytona Beach, Florida - January 22, 2019 - When the cars of the IMSA WeatherTech Sports Car Championship roll into Daytona next week for the Rolex 24, one will look a bit different from the past. 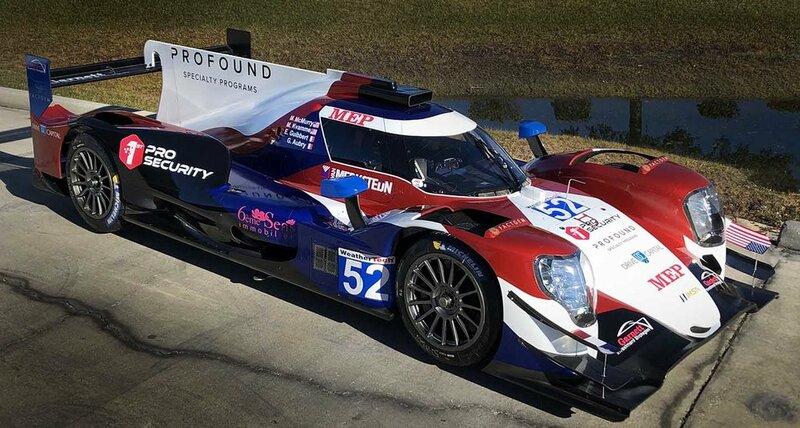 That’s because the LMP2 entry of PR1/Mathiasen Motorsports will present three new sponsors and carry a new red, white and blue livery recognizing its youthful American-French full season line up of Matt McMurry and Gabriel Aubry. Profound – an insurance firm with 20+ years of experience in the motorsports industry offering coverage in areas like tracks, sanctioning bodies, car clubs, driving schools and more – headlines the new Rolex 24 event sponsor lineup that also includes Garnett Investments and 1st Pro Security. Garnett Investments is an accredited wealth management group headquartered in Nebraska, while 1st Pro Security is a premier venue and event security firm integrating best in class technology with highly trained security personnel. The trio will join MEP and Van Merkstedn, who are already committed for the season. Fans are invited to view the new livery up-close, meet the drivers and ask questions in the paddock at the PR1/Mathiasen garage at 11:30 a.m. on Friday, January 25. The first 100 fans in attendance will receive a free PR1/Mathiasen t-shirt. The garage number for the team is 12, the best position among the LMP2 field as a result of the team finishing first during qualifying at The Roar earlier this month. “Everything has come together very nicely as we head into the 2019 season, from our new event partners, to the drivers, and everything in between,” said PR1/Mathiasen owner Bobby Oregal, who added that the team recently finalized agreements with drivers Mark Kvamme and Frenchman Enzo Guibbert to complete its Rolex 24 lineup. Kvamme has 70-plus races to date in the IMSA WeatherTech Sports Car Championship, Porsche GT3 Challenge USA, Porsche Mobil 1 Supercup, Michelin Le Mans Cup, and Ferrari Challenge North America, among others. The 23-year-old Guibbert has multiple karting championships to go with his prototype experience in the European Le Mans Series, including an LMP2 pole at Monza and two podiums, and GT work in the Blancpain Endurance Cup, GT4 International Cup and Championnate de France FFSA GT.